Forget PIK: China's financial innovation has taken the concept of pay-in-kind bonds to a whole new level: PIG. Regular readers of Zero Hedge are familiar with money-for-oil loans. But, as we reported last November, one liquidity-challenged pork producer implemented an absurd twist on that concept that has helped to expose the financial dysfunction at many small- and medium-sized Chinese companies. Instead of receiving cash, holders of local-currency bonds issued by Zhengzhou-based pork producer Chuying Agro-Pastoral Group - which had 1.3 billion yuan in cash against a short-term debt load of 8.4 billion yuan - would be paid with the company's ham, thanks to an agreement reached between the company and its creditors. The agreement was struck after the company failed to repay a 500 million yuan bond that was due last Nov 5. The spread of African swine fever caused pork demand in China to plummet, creating a cash-on-hand crisis for pork producers. Well, if you thought that was absurd, you will love what happened next, because according to an announcement on the Shenzhen Stock Exchange, the aptly misnamed Agro-Pastoral Group has run into a new problem: after running low on cash, it is now running low on pigs. The cash crunch that initially left the pork producer unable to service its debt has now intensified to the point that it’s unable to buy enough feed, which has contributed to the company's pigs’ death rate being higher than expected. This, as Bloomberg notes, was the latest twist for the small-cap company that’s been challenged on multiple fronts, from the spread of African swine fever - which has seen more than 900,000 hogs culled across the country - to an economic slowdown to a deleveraging drive by policy makers that’s tightened credit flows to weaker borrowers. As a result of the latest liquidity - and pork - shock, the central China-based company revised its 2018 performance forecast to an even greater net loss of 3.3 billion yuan, up from 2.9 billion yuan. However, missing loss expectations may be the least of the company's worries, which has 2.3 billion yuan of bonds it needs to repay this year, according to data compiled by Bloomberg. It is known the company does not have the cash to make this payment; now it may not even have the pigs to pay "in kind." Agro-Pastoral is hardly the first company to propose innovative terms to its creditors: last year, a financing platform under troubled conglomerate HNA Group offered investors air tickets rather than cash for debt repayment. 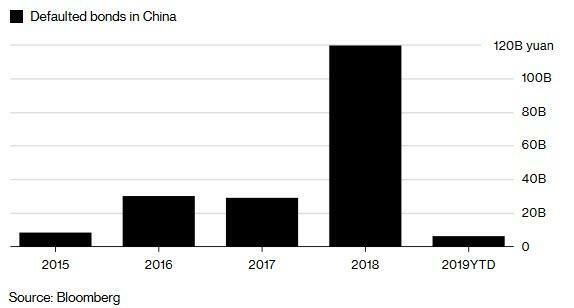 It also won't be the last: as we reported last year, in 2018 China was hit by a record wave of onshore bond defaults. These defaults have shaken the faith of the country's bondholders, created anxieties among international investors, who have only recently gained entree to the Chinese bond market, and forced the PBOC to reverse some of its tight-money policies aimed at facilitating a deleveraging in China's heavily indebted corporate sector. It has also prompted such arrangement as "Payment In Ham." As one fixed-income analyst who spoke with the SCMP recently pointed out, so-called "payment in kind" typically isn't acceptable to bond holders, although when there is no other value they will take anything, even pigs. And while the "payment in ham" only added to concerns surrounding the solvency of small and medium-sized Chinese businesses, investors shouldn't worry. Because the Communist Party is coming to rescue them. Incidentally, for those wondering, one gift package of Chuying Agro-Pastoral's ham costs 8,999 yuan or about $1,300. 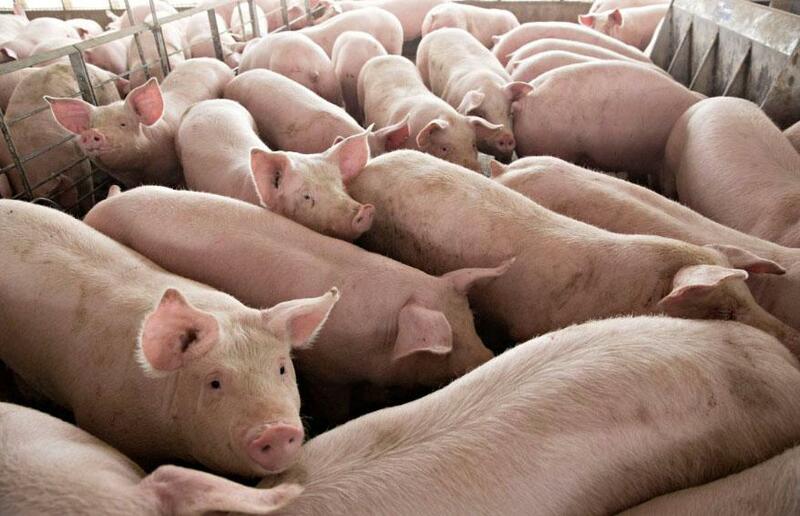 Assuming it takes one pig to make one such package, the company will have to remit just over 255,000 pigs to its creditors in lieu of the upcoming bond maturity, assuming of course that the credit hedge funds who are invested in the pig farmer have space in their office of a few hundred thousand pigs.